Description: Free, public domain image: T-38 Talon Twin Engine Supersonic Jet Flying in the Clouds. The T-38 Talon is a twin-engine, high-altitude, supersonic jet trainer used in a variety of roles because of its design, economy of operations, ease of maintenance, high performance and exceptional safety record. It is used primarily by Air Education and Training Command for undergraduate pilot and pilot instructor training. 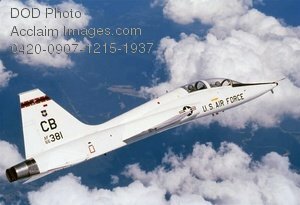 Air Combat Command, Air Mobility Command and the National Aeronautics and Space Administration also use the T-38 in various roles. (U.S. Air Force photo/Staff Sgt. Steve Thurow.